Good variety in the cigars. Really liked a couple of them. Of course every cigar Isn't for everyone. But overall a good sampler. 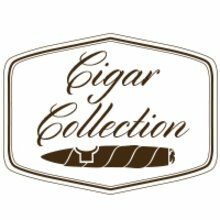 Great cigars at a great price. I was excited to be able to try a couple of these for so cheap because of this sampler. Got this sampler as some great "freebie" when I bought about $200 worth of good cigars. Buncha cheap junk. I see the normal price for this is $20 and change, which means they average $4 each. I wouldn't pay more than $10 for this sampler. Various combos of flavorless, harsh, flat, not one had complexity... just really cheap cigars. 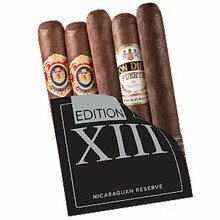 I can think of quite a few sticks that are $4-$4.50 each that are FAR better than these, like AB Sungrown, Punch Grand Puro and AJ Nicaraguan Series. Save your money. Great Samplers. Gives you many different options for a great price. I would buy them again. For the money, this is one of the best samplers JRs sells. The Don Diego is a smooth, lighter cigar (good for morning) and the Juan Lopez and Omar Ortez offerings are both great, fuller flavor sticks for the afternoon or after dinner. All five are quality cigars. Had this sampler several times and it never fails to please. What a deal! Was not dissapointed. Full flavor perfection. Will buy more if offered again. I especially liked the omar ortez. It has a nice mix of cocoa and pepper. I'm not normally a maduro wrapper fan but this was an exception. This sampler package arrived round 4pm, they were GONE by 10 pm shared it with my poker bodies, no one complained, we had a room full of smoke and good time. Thanks JR it was good timing. The sampler was more than I anticipated. I have not finished all of them, but the one's I have were very good indeed. Good construction, good draw, and pleasantly surprising in the taste. The brand is not one I normally buy, but that is why samplers exist, right? Nice bundle. Great value. Good taste. Very surprised by this sampler. 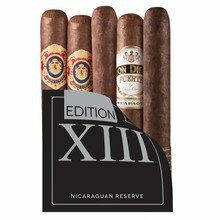 Nice group of Nicaraguan smokes at a fantastic price. I would definitely recommend buying this sampler.